Signs of Spring 11: Invaders All Around Us! 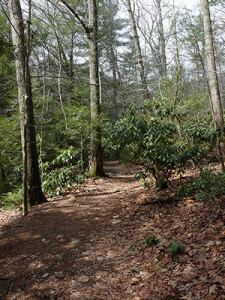 Deborah and I have been out hiking on quite a few woodland trails this spring. One of the generalized observations we have made concerns the preponderance of alien, invasive plant species that make their ecological presence known long before most of the native species. Early leafing and early flowering are excellent strategies for an invasive plant to gain a “foothold” in our deciduous forest ecosystems. 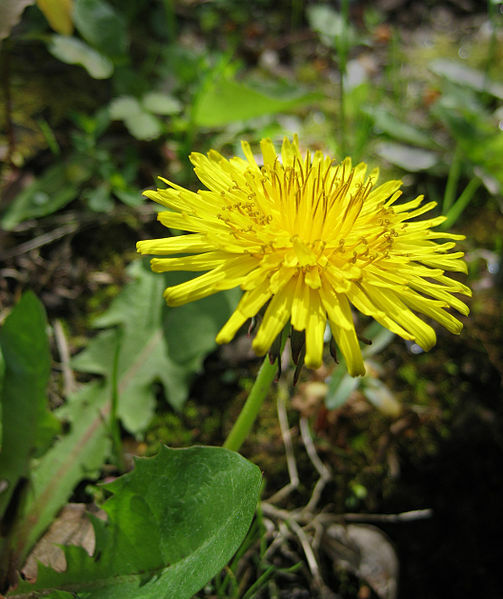 Add the ability to make abundant seeds and an absence of co-evolved biological controls and these exotic, invasive plant species can truly come to dominate an ecosystem! Most of the trails we have been walking on have been lined by multiflora rose (Rosa multiflora). 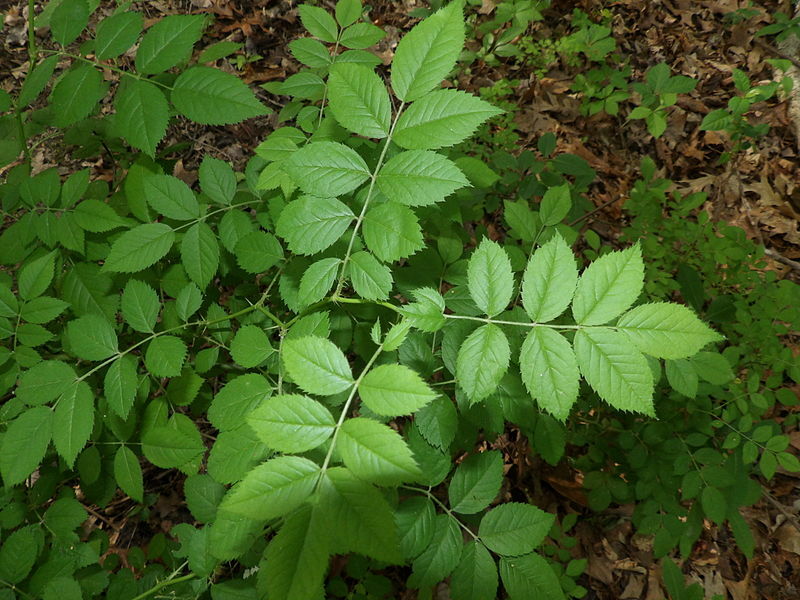 Multiflora rose is one of the first understory plants to sprout leaves in the early spring, and its fresh leafed appearance makes entire wooded hillsides glow green. I had mentioned previously seeing this plant’s just unfolding leaf buds out at Harrison Hills Park a few weeks ago. This is time of year to appreciate how much multiflora rose there is in our Western Pennsylvania ecosystems! Unfortunately, the story about this plant is both good and bad. It is an extremely aggressive and rapidly growing exotic invasive (from Asia, brought to this country as an ornamental plant) that has choked out many native plant species. It also, though, generates very favorable habitats for many species of small mammals and birds. I have a large, dome-shaped multiflora rose thicket down at the far end of my field. I remember consciously mowing around a spindly rose stem twenty-five years ago and watching over the next decade as the multiflora rose spread and grew into a eight feet high and twenty feet diameter thicket. There is a large woodchuck burrow in the middle of this thicket and almost always a rabbit or two hiding out in the low tangles of thorny branches. Cardinals and house finches perch and nest in the upper branches. Nothing is growing under the thicket, though. The constant spring and summer shading prevents the survival of any other plants. Small low growing leaves of garlic mustard (another invasive plant brought in from Europe) dot almost every forest floor we walk past. 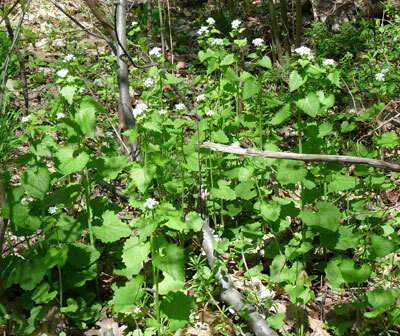 Garlic mustard (Alliaria petiolata) is also an “early riser” in the spring and is also doing a great deal of damage to native plant species. Along with its ability to make abundant seeds and grow in a wide variety of soil and habitat conditions, garlic mustard also releases poisonous, allelopathic chemicals that negatively affect the soil fungi (“mycorrhizal fungi”) upon which most trees and many other plants depend for nutrient absorption. It has also been noted that white-tailed deer seldom feed on garlic mustard (but, as we know, they do eat almost everything else!). The expansion of this alien plant species has been extensive and rapid. 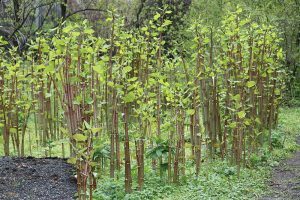 Japanese knotweed (Fallopia japonica) is not a particularly early spring sprouter, but its tall, dry stalks dominate sections of trails that are near roads or rivers or railroad tracks. Under these dense, old stalks we are just now, almost exclusively seeing new, green sprouts of knotweed. Almost no other plant species are able to grow in these thickets. Knotweed has an amazing ability to spread vegetatively. The tiniest piece of a stalk or leaf is able to grow into a new plant. 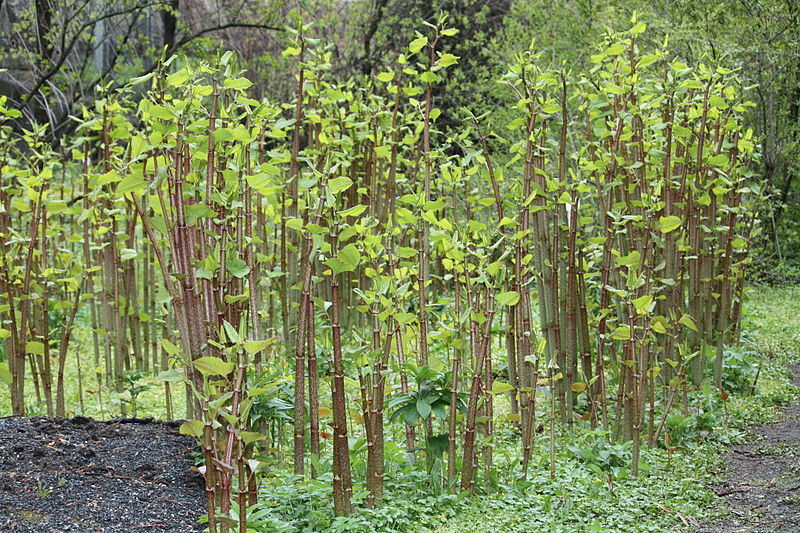 When I see trail workers in the summer using power trimmers to cut down knotweed, all I can think of is that they are broadcasting new propagules of the species far and wide along the trails. We have also mentioned several other alien plants in a much more positive, “signs of spring-like” sense. Forsythia (Forsythia suspensa) is a species from China that has been widely planted in European and American gardens. It has also “escaped” into the wild and has formed dense thickets of feral plants. Daffodils (Narcissus spp.) are native plants of Europe, Asia, and northern Africa. They have been widely bred and planted throughout North America and have also “escaped” into wild habitats. Both of these plant species are beautiful harbingers of the spring season, but we have to remember that they are exotic invaders! There is such a long list of these exotic flowers, shrubs and trees! Dandelions, privet, tree of heaven, burning bush, Norway maple, poison hemlock, Queen Anne’s lace, English ivy, several honeysuckles, Russian olive, and Kudzu are just a few of the better known species. The U.S Fish and Wildlife Service estimates that there are 50,000 non-native species in the United States and that over 4000 of these are dangerous invasives! Are alien species always “bad?” The impacts of many exotics would suggest so. The loss of less aggressive or less fecund native species that are unable to compete with these very robust invaders is a serious blow to local biodiversity and may have extensive, reverberating impacts throughout an affected ecosystem. There are suggestions, though, that in some cases and in some ecosystems alien species may actually increase the biodiversity and “quality” of an ecosystem. It is very logical that the answer to the question about the impacts of invasive species should not be as simple as we once thought. Many animals, as we saw above, use multiflora rose thickets for protective habitats, many birds eat honeysuckle berries, and the honey made in the fall from knotweed nectar and pollen is dark and delicious! In his book “1493,” Charles Mann visualizes the European discovery of the New World as a moment that began the reversal of the breakup of the supercontinent Pangea that occurred some 250 million years before. The human generated movement of plant and animal species, both domesticated and agriculturally focused and also wild and uncontrolled, between the now widely separated continents is generating an increasingly homogenous Earth-wide biome dominated by a small set of aggressive, generalist species. Mann even defines this as a new geological epoch, the Homogenocene. Invasive species, then, may be the defining features of our future world.